I have pictures to post... about a fun yesterday ... but I don't have the energy to tell you about them. I do have the energy to tell you this: yesterday Mother, Elizabeth, Anna and I went to the Colfax Methodist Church's Pancake Breakfast, then put flowers out on my dad and twin's grave sites... and my grandparents' and Aunt Janie's grave sites, too. Hmm. I was just going to post the pictures and not write out any words of explanation, but in downloading them (or uploading them) (or somehow 'loading' them) I got energy! Here Baby Anna is being held by dear Georgianna, who is Anna's 6th cousin 4th removed (something like that). Here is Mother with a Colfax native. 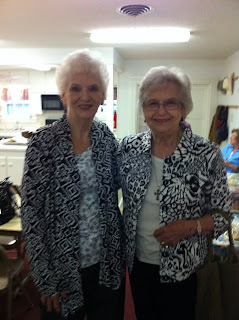 I took their picture because they both got the what-to-wear memo. Here are Mother, Elizabeth and Anna by the grave sites with Ernie. Ernie does everything for everybody out there in Colfax... and we consider him family. Here is the cemetery with the church in the background. Then we went to Canton Trades Day! 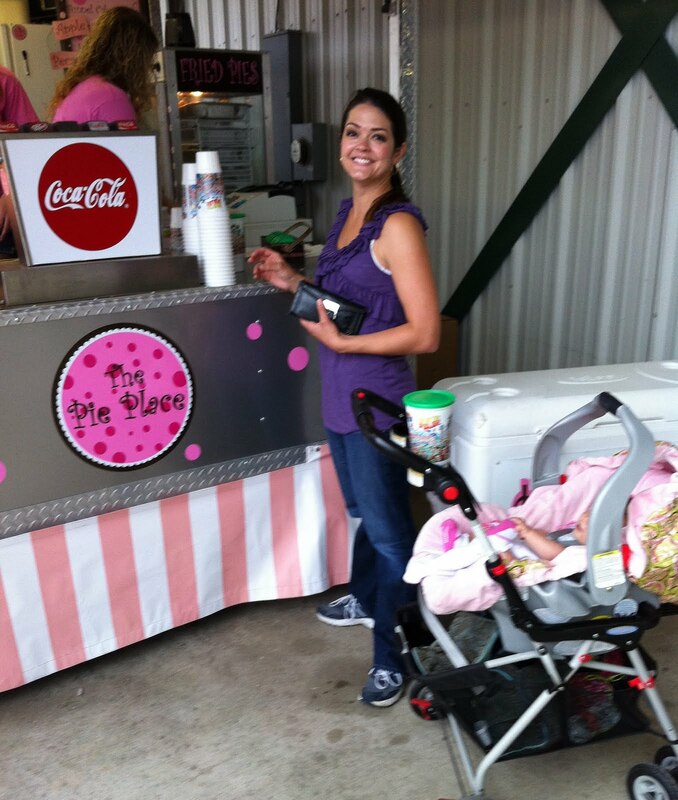 Concession stands are some of our favorite places to 'shop' there! Elizabeth, Anna and I rode the trolley to the main fairgrounds. Little Anna got lots of oohs and ahhs and smiles from folks getting on and off the trolley. Then we watched a style show at the Canton Marketplace - the indoor mall-thing - where Mother stayed the whole time and did her shopping. 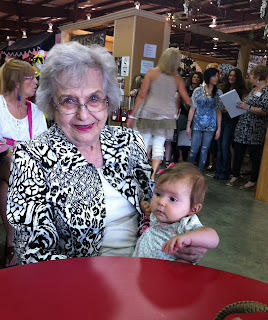 Then Mother got to take care of her precious great granddaughter ... who, by the way, was PERFECT all day!!! She could not have been better if she'd tried. Elizabeth told me you guys were headed there this weekend -- looks like a good visit! Glad you did yesterday and not today - it's chilly! It was a wonderful, special day! And you have to point out that you didn't buy anything!!! Well, except delicious kolaches and nachos! looks like a lot of fun! glad it was such a great day--and not super stormy like today!